The Red River and its tributaries have created a fertile land filled with history and pictureque nature. Cycle on the dyke of the Red River through local villages, ancient temples and endless green fields of rice. We board a boat to cruise on a windy river through limestone karsts jutting out of rice fields. A visit to the ancient capital of Han Lu before we get back to nature at Cuc Phuong National Park. . Transfer out of Hanoi and start riding on a dyke along the Red River to visit the pottery village of Bat Trang. Then cycle on to the heart of the delta where ancient pagodas and temples can be seen along the way. We overnight in Tam Coc. In the morning ride to Hao Lu, the ancient capital of the Dinh and Ly Dynasties. We cycle pass rice fields and mountains before we visit Dinh Le Temple. Then we follow the Hoang Long River through impressive landscape to our guest house in Cuc Phuong. Explore Vietnam's first national park and visit the Endangered Primate Rescue Centre where wild animals are being rehabilitated. Through the park we cycle to the peaceful riverside town of Chi Ne to have lunch before heading back to Hanoi. The Red River Delta tour was the ultimate way to get a deep look into Vietnam's countryside. It's a bit of a bumpy ride but you'll find yourself amazed by the adventures through village backroads and stunning landscapes of rice paddies and mountains. I enjoyed the biking. I enjoyed the history, facts and knowledge of the guide about customs. Enjoyed the different foods. Suitability: The daily distances are not too long and the terrain is gentle so this trip is suitable for most people, but it’s advisable to have a modicum of fitness to enjoy the riding! Biking Conditions: This trip is a mixture of hard-packed dirt trails and tarmac. An air-conditioned bus travels behind the group to support us and participants can cycle as much or as little as they like and still enjoy the same views as the rest of the group. A day exploring the countryside and local artisans. We have a short transfer out of the city to avoid traffic and start with a lovely ride on a dyke along the Red River, a perfect quiet place to get used to cycling in Vietnam. Our first stop will be Bat Trang, known for handmade ceramics. The pottery is quite varied and interesting. We then cycle south into the heart of the delta passing through many traditional villages and rice fields. We will have a two hour transfer to lunch in Tam Coc. In the afternoon it's back on the bikes to ride a bit off road amongst karst cliffs to a small pier. We board a boat for a leisurely cruise on the Ngo Dong River, and float through three natural caves, the largest of which is 125 m long. Sit back, relax, see rural Vietnam from a different perspective and take in the dramatic limestone karst jutting out from the green rice fields. We disembark and cycle back through the karst cliffs to visit Thai Vi Temple, one of the oldest temples in Vietnam, built in the 13th Century. We start cycling from our hotel in Tam Coc for a flat ride to the town of Hoa Lu, the ancient capital of the Dinh and Ly dynasties. 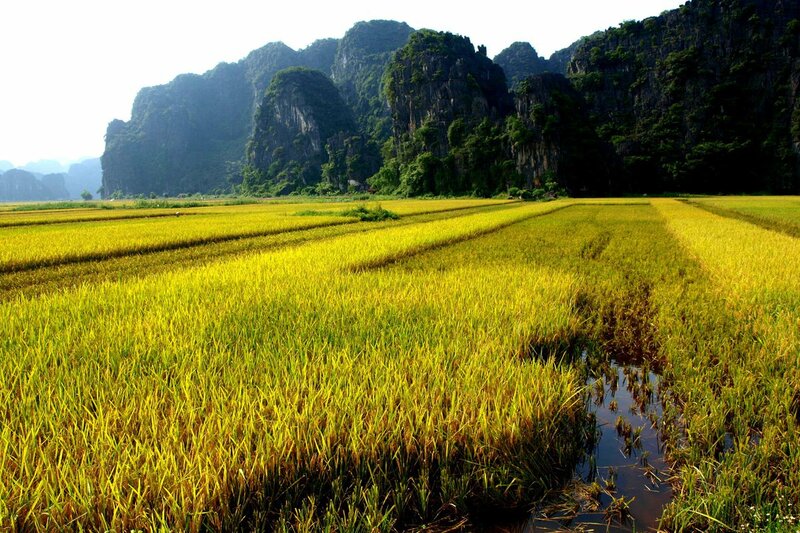 The route is stunning as you pass green rice fields amongst karst mountains. After a stop to visit Dinh Le Temple, built in the shape of a Chinese character in the 17th Century, we continue pedaling along the Hoang Long River through some impressive landscape. The first 35 kms are flat and then we'll have some small climbs up to the park, but they are all short. After the lunch at entry of national park, we continue cycling to the center of the park and then have the option to transfer or cycle the 20 kms back to our overnight accommodation in the park. This morning you will have the opportunity to explore Vietnam's first national park and hopefully sight one of the 97 species of mammals said to inhabit the park. We visit the Endangered Primate Rescue Center where a wide variety of native monkeys and gibbons, including critically endangered langurs were saved from wildlife smugglers and are being rehabilitated to return to the wild. Continue cycling from the park to Chi Ne, a small peaceful town on the banks of the Boi River. Here we have lunch before we head back to Hanoi. The drive will take one and a half hours and we should arrive by late afternoon. The bikes you will be riding are well-known makes of mountain bikes with lightweight alloy frames, 24- to 27-speed gearing, v-brakes and Shimano components and front suspension. The mountain bike is included in the tour. You also have an option to hire an electric bike (or an E-Bike) for the price listed in the tour pricing section. We have 2 sizes available: S = 155 cm - 170 cm and M = 171cm - 180 cm. The E-Bikes are GIANT brand with SHIMANO Alivio1,9 speed, disc brakes, and adjustable suspension fork.